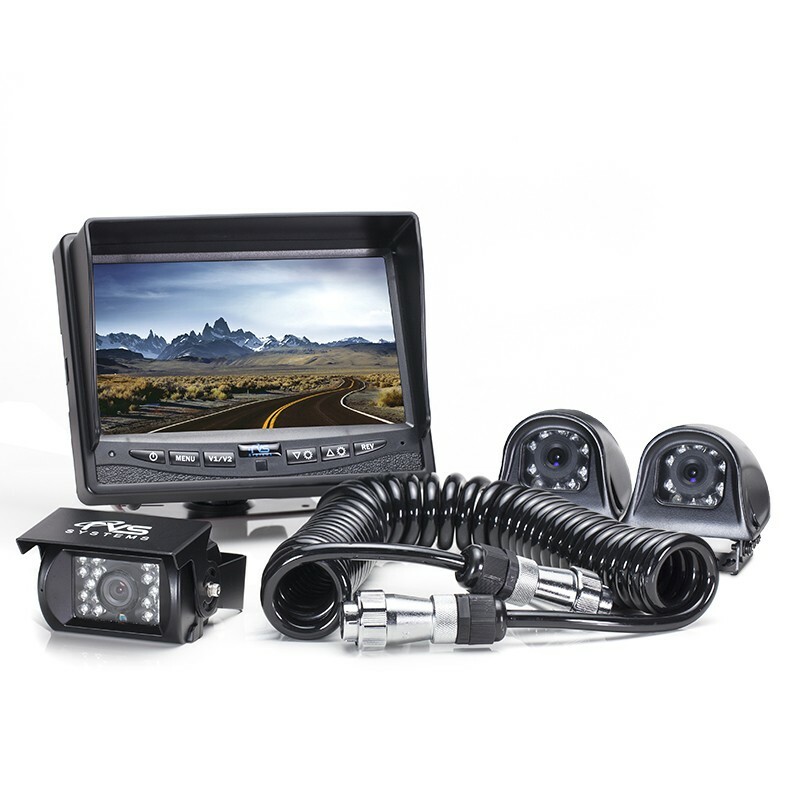 This backup camera system is perfect for the fifth wheel or travel trailer application, allowing you to mount three cameras to your trailer and quickly connect or disconnect them with just one cable! The system comes with 1 backup camera and 2 side-view cameras which are ideal for blind-spot viewing on a large vehicle. 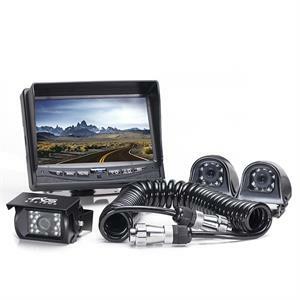 Included in this system is a crystal clear 7" DIGITAL TFT LCD color monitor with mirror image capability, a 3 channel multiplexer with automatic system switch, one (1) 130° CCD Backup Camera, two (2) 120° CCD Side Cameras and all the wires, connectors and mounts you will need. The 5th wheel rear view back up camera system is completely weatherproof with an IP69K rating. The system is strong and reliable, shock resistant with a 20G vibration rating (highest in the industry) and comes with a full year warranty. pixel resolution of 800 X 480.
with the remote which comes included. mounted flush on the vehicle if so desired. and come with Aircraft Grade Cable Connections. guarantees no glare from these infra reds. receives all camera feeds and sends them to the monitor. Its three inputs allow for multiple camera connection. with a separate trigger wire for each camera connected.